Town boss Nathan Jones paid tribute to a thoroughly professional display from his side as they beat Fleetwood to move up to second in the League One table this afternoon. Harry Cornick’s close range strike on 11 minutes set Town on their way, while they they had to wait until 10 minutes from time to make sure of victory, Danny Hylton's cross deflecting in off visiting skipper Craig Morgan. That was enough for a sixth successive home victory, as Jones said: “The weather was that bad, that if it was yesterday, the game would have been off. "We couldn’t slick the pitch up as it as going to be too wet, so conditions were not conducive for a real football match. “But I thought we put in a thoroughly professional performance, as we weren’t at our fluent best, we didn’t dominate, they came and made it very difficult. 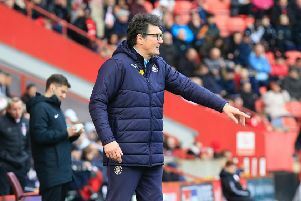 “They played a back five, a diamond and one up top, they came to contain us really and that kind of went out the window by getting an early goal, which is what we like to do when teams try to do that. “It was a difficult afternoon as these are a good side, they’ve got so many good players, players who have played at a higher level. “They’ve changes shape three or four times, to try and find way back into it, so we had to contend with all that.